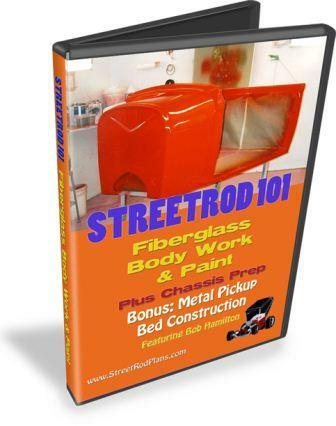 We are very proud to introduce the third DVD set in the successful StreetRod 101 series featuring Bob Hamilton: Fiberglass Bodywork & Paint, Plus Chassis Prep with Bonus Metal Pickup Bed Fabrication. This new 4-hour instructional DVD shows you how to eliminate the imperfections found in most fiberglass bodies. As everyone knows, it’s preparation that’s the key element in a great paint finish and that’s what Bob shows you how to do in this informative DVD. This isn’t a video about how to set up a spray gun, run a compressor or mix paint. It’s about all the mission critical elements you want to take care of before it gets to that point. Plus, if you follow what Bob shows you how to do in this 2-DVD set you’ll be able to save a fortune when it comes time to lay down your paint finish. As the name indicates, this new DVD also covers a wide range of important chassis prep things you’ll want to do from dressing welds to brake line pressure testing. And to top it all off, Bob has included an in-depth bonus feature that shows you how to fabricate a sheet metal pickup bed that not only looks terrific but is incredibly functional and designed for rugged use for many years to come. Take a look at this extensive list of just what you’ll learn from this valuable DVD set and then check out how you can get your very own and save big, too. We’re excited to be able to offer this comprehensive information to the hot rod building world as the third installment in Bob Hamilton’s StreetRod 101 DVD series. You get it all of this promptly delivered to your mailbox on a high quality, four hour DVD set that you will use regularly and treasure for a lifetime for only $24.99 plus $5 shipping and handling ($15 international). Just click on the “Add to Cart” button below. And while you’re at it, you can also add the other volumes in the StreetRod 101 DVD Library at big multiple DVD set savings, too. I found the DVD set to be very informative especially the added sheet metal bed construction. I’ve watched the set several times and each time I catch something I missed. Well pleased with my purchase. I was disappointed. The bodywork part was ok but there wasn’t any painting. I have this DVD in my collection. I found it very informative and useful for when building my Hot Rod. Well worth the purchase price. Like all the other videos in the set, well worth the price.